Early after viral entry most of the tegument proteins are released in the cytoplasm and they performed different tasks. Some proteins are dedicated to the inhibition of antiviral response. The HHV-1 US3 hyperphosphorylated and thereby inhibits host IRF3. The HCMV UL83 also inhibits IRF3. The KSHV protein ORF45 plays a role in the inhibition of IRF7. 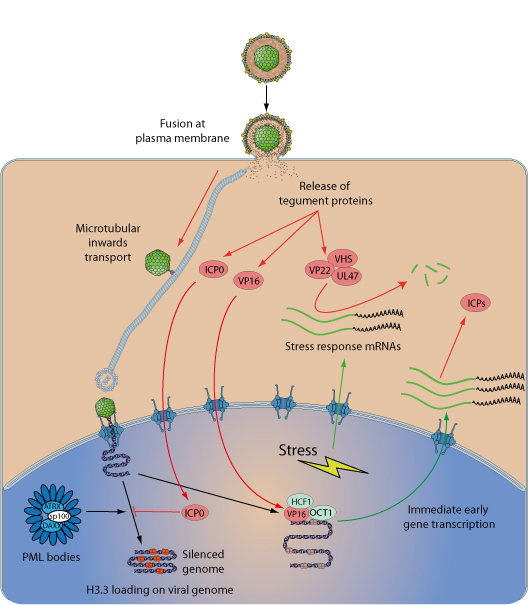 The tegument proteins are also required to inhibit the silencing of the viral genome by host. In herpes simplex virus 1, ICP0 migrates to the host nucleus where it targets the PML bodies to avoid viral genome silencing through histone modification. The PML component DAXX is also targeted by HCMV UL82 , or Epstein-Barr virus BNRF1 . Other tegument proteins are required for viral transcription such as HHV-1 VP16, the HCMV proteins UL35 and UL82 .